The truth about Donald Trump’s scandal-plagued designee to deconstruct the Environmental Protection Agency, climate-science denier and corporate errand boy Scott Pruitt, will begin to be revealed on Tuesday. So the Senate rushed on Friday to confirm Pruitt as the nation’s new EPA administrator. Even in the #AlternativeFacts universe that is Donald Trump’s Washington, that may look like a bizarrely irresponsible rejection of basic duties. 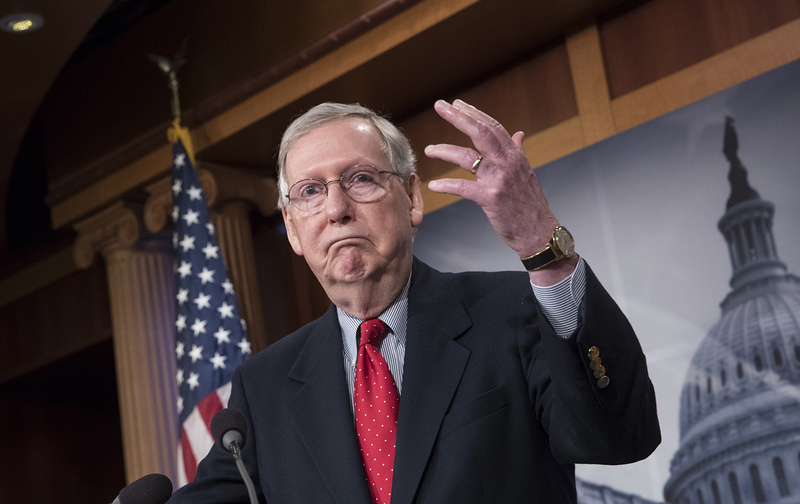 But in the US Senate that Mitch McConnell has remade to serve as a rubber stamp for Trump’s presidency, the bizarrely irresponsible rejection of basic duties is now standard operating procedure. Senate Democrats tried on Friday morning to restore a measure of order. They asked to extend deliberations on the Pruitt nomination, so that the Senate could have an informed debate. They had every reason to request the extension. On Thursday afternoon, as the Senate was beginning what would turn out to be the final (if woefully incomplete) review of the Pruitt nomination, Oklahoma County District Judge Aletia Haynes Timmons found evidence of an “abject failure” on the part of Pruitt, in his role as state attorney general, to abide by the Oklahoma Open Records Act. Timmons ordered Pruitt to release his communications with the oil, gas, and coal industry insiders. For two years, Pruitt had withheld more than 2,500 e-mails with fossil-fuel interests, which had been requested by an investigative-reporting group, the Center for Media and Democracy. Judge Timmons gave Pruitt’s office until Tuesday, February 21, to release the e-mails. She also gave the office 10 days to release related materials that might reveal controversial or inappropriate contacts between the hyper-partisan attorney general and interests regulated by the EPA. The Senate failed the test, and the Pruitt nomination was rammed through in spite of repeated requests by Oregon Senator Jeff Merkley and others for an extension of deliberations until after the release of the e-mails and an appropriate review by senators. Merkley initially asked that the Pruitt vote be put off until after the release of all materials that had been withheld by Pruitt’s office. Senate majority leader Mitch McConnell, who had not been present for most of the debate, suddenly appeared and grumbled, “I object.” Senator Merkley then made a more modest request that the Pruitt vote be moved until immediately after the Senate returns from its Presidents’ Day break. “I object,” declared McConnell. Every effort by Senator Merkley to set aside enough time to review the nomination of Pruitt to take charge of an agency with more than 15,000 employees and an $8 billion budget—and to abandon the historic mission of that agency—faced a McConnell objection. The Republican-controlled Senate finally upheld the McConnell objection to a full review of Pruitt. A frustrated Delaware Senator Tom Carper came to the floor of the Senate and declared, “We are preparing to vote here with incomplete information.” And so they did, approving the Pruitt nomination by a vote of 52-46. The majority leader got his way. The Senate rejected its constitutional responsibility to review presidential nominations before providing “advice and consent” that is required for cabinet picks to assume their posts. In its place, the majority embraced Mitch McConnell’s new standard. That standard says that, when it comes to doing Donald Trump’s bidding, the Senate will proceed without respect for the facts—and the truth that might be revealed by those facts. “What happened today was an egregious cover-up, and a total abdication of the Senate’s constitutional responsibility to vet nominees before voting,” Senator Merkley said after the vote. Senator Merkley did not prevail. But he upheld his oath to “support and defend the Constitution of the United States.” McConnell abandoned that oath and shamed both himself and the Senate by establishing the Scott Pruitt rule: #TheTruthBeDamned.